The holidays are a time of cheer, and just the idea of being at the beach makes us feel jolly. Harness that feeling throughout your home this year and leap into a nautical holiday season. Here are 5 easy holiday beach crafts that will provide your home or vacation rental with a coastal holiday charm. Creating the perfect holiday wreath from seashells is easier than it looks! 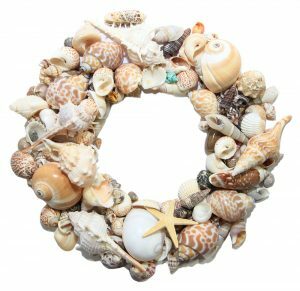 Though it may take some patience, a seashell wreath will provide an excellent addition to your holiday décor. Begin by wrapping the wreath form in your choice of ribbon. Optional: paint the seashells various colors of your choosing. Lay out the seashells around the wreath form and start gluing. Helpful tip: alternate the direction of the shells for a more complete look. Add your finishing touches and start enjoying the beauty of your holiday seashell wreath! 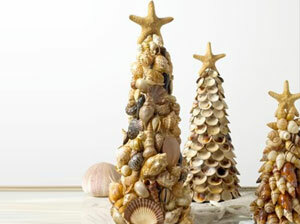 Seashell ornaments are the perfect way to add a touch of the beach to any tree. These ornaments also make perfect gifts for your family and friends whom enjoy the beach or are homesick from their coastal hometown. 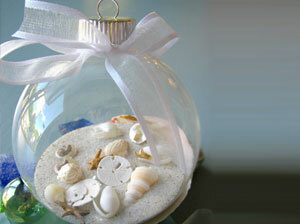 Materials: clear glass ornaments, sand, tacky glue, small paint brush, ribbon, tony beach shells and a piece of paper. Remove the lid from your clear glass ornament. Make a funnel out of your piece of paper. Pour sand into your ornament using the funnel (you can even add in glitter for an extra sparkly look). Drop in tiny sea shells, sand dollars, starfish, sea glass, etc. Take your paint brush and add some tacky glue around the rim of the ornament. Place the lid back on the ornament. Tie your ribbon into a bow around the ornament’s lid. We suggest holiday colors such as: white, silver, gold, red or green. Enjoy your homemade, beach style tree ornament(s). Any beach vacation means you will be bringing home a bag or bucket of seashells. 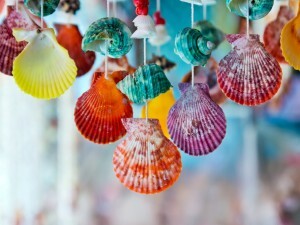 Don’t let these shells stay tucked away in a closet; enjoy them all year round by turning them into wind chimes. Now every time you hear them blow in the breeze, you will remember those special beach memories. Materials: old lamp shade, drill with small drill bit, seashells, cotton string (twine), pair of scissors. Wash your shells to remove any dirt or sand. Drill one or two hole in each of your shells just big enough for the string to fit through (make sure your area of the shell you are drilling is lying flat to avoid any breaking). Run your string through the shell and knot it off so the shell stays in place. Place shells as far or as close as you would like and continue this process throughout your strand. Based on how big of a frame you are working with you might want to create at least 8 strands. Tie those strands to your upside down lamp shade. Hang your wind chime outside and listen to the sound of the shells. Who doesn’t love the scent of a good candle?  This easy to do home décor project will lead you to placing candles throughout your home. Creating your own unique candle will bring back memories of beach vacations past. 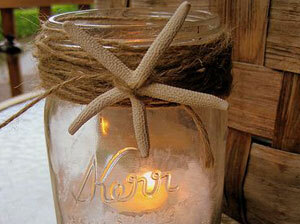 Materials: mason jar, sand, candle, craft rope, large nautical focus point (starfish, sand dollar, anchor, etc. ), lighter, hot glue gun. Fill your mason jar with sand. Place your candle in the sand and be sure the amount of sand is securing your candle in place. Wrap your craft rope around the rim of the mason jar as many times as you like and tie it off. Use your hot glue gun to secure your decorative object in place on the rope. Light your candle and enjoy. Make it a holiday candle holder: Replace the rope with a colored ribbon and add some holly for a sleek, elegant look. Place your cone on its base. Begin gluing shells from the bottom to top. You can choose to sure all the same shells or different styles on your tree. Top your tree with a mini starfish and place in an ideal location. We love these craft ideas and hope you do too! Don’t miss out on some excellent shelling opportunities for your next DIY project during a visit to Emerald Isle. Browse from over 700 vacation rentals and book your next getaway to the Crystal Coast!